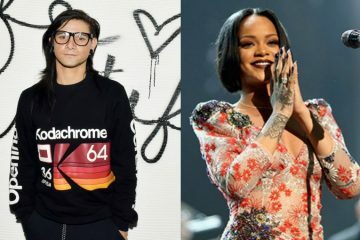 Skrillex’s plate is filled with incredible content to finish, from his anticipated collaboration with Utada Hikaru to the highly anticipated LP he has in the works and has done quite a good job of keeping far under wraps. Today sees a peek into his work with a heavy hitter on his label: Joyryde. An unmistakeable screenshot of Skrillex’s laptop with logos of Dropbox, Splice, and all with Ableton in the background contained a file title we should be anticipating shortly. “AGEN WIDA” hasn’t been detailed as a single from an upcoming package or just a one-off on the label. As we expected, the two revealed nothing but emoji speak on twitter; Skrillex with a speaker, Joyryde with some water guns, and even Jauz chiming in with the scheming faces. How pumped are you for all this audio goodness? Let us know on Twitter @Globaldanceelec.